This is a cute dress to put on for lazy summer days when you want to look cute and put-together. The Lazy Daisy Tiered Dress is lined below the waist. It has a unique tiered layer at the bust with a band of floral crochet lace on it. The attached skirt also has a tiered design with crochet lace on each layer. Adjustable leatherette shoulder straps add contrast and give this dress a cute, casual vibe. 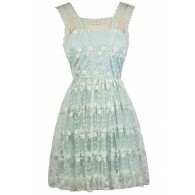 The Lazy Daisy Tiered Dress would look nice paired with wedges, strappy sandals, or flats. Another option is to pair this dress with cowboy boots to match the leatherette straps for a cute country look. Details: Lined below waist. Animal-friendly vegan leather straps. 100% polyester. Contrast: 100% cotton. Hand wash cold water. Do not bleach. Line dry. Iron low. Do not dry clean. Small measurements: Length from top of bust to hemline: 26". Bust: 32". You have added Lazy Daisy Tiered Dress in Bright Yellow into Wishlist. You have added Lazy Daisy Tiered Dress in Bright Yellow for Stock Notification. You have set Lazy Daisy Tiered Dress in Bright Yellow as a loved product. You have removed Lazy Daisy Tiered Dress in Bright Yellow as a loved product.